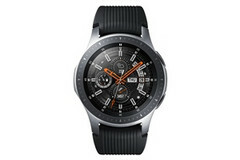 The event that provided the Galaxy Note 9 with its debut also introduced the Galaxy Watch, Samsung's new smartwatch. This device, like the latest Note, uses Bixby as a virtual assistant. The new Galaxy Home smart speaker also runs Bixby. The Galaxy Note 9’s release event revealed nothing new about the phone. However, it also introduced a new part of the Samsung ecosystem: the Galaxy Watch. The new smartwatch has the connectivity to pair well with the new Note. However, it also has LTE connectivity, for stand-alone operation. The new watch has a full, "high-res" AMOLED touchscreen, but also somewhat resembles a typical watch. On the other hand, it looked a little thick on the wrist of Alina Vives, the Samsung executive who presented it. The Galaxy Watch comes with the health, fitness, connectivity and productivity apps you might expect from a Samsung product. However, it also has the new iteration of Bixby, Samsung’s own take on the virtual assistant. This version of Bixby was presented as integrated with improved AI, and as being responsive and flexible in conversation. It was also portrayed as being able to do things such as fetch available rides without the necessity of having installed Uber beforehand. Samsung also debuted a new smart speaker, the AKG- and Harman-powered Galaxy Home, for the same purposes. However, Bixby’s inclusion in the Galaxy Watch – as well as the Galaxy Note 9 – may be a matter of taste from user to user.